2.  Should use a portable or stationary generator for my home or business? Read each section carefully and you will see how each type of generator fits into you power backup planning. Power Generation, What Size Do I Need? In the past, enduring a power outage was as simple as lighting a candle and the fireplace. Not anymore. Without electricity, basements can flood. Security systems can falter. Home businesses can fail. Many homeowners are unable or unwilling to wait out the next power outage, so they are installing backup power systems in their homes. The first step in purchasing a backup power source is figuring out how much power you need. Power generation systems are rated according to the number of kilowatts (kW) of electricity they produce. The following chart quickly summarizes how much electricity various power generators can produce. 6.5 kW A small system to keep all the survival appliances operating and a few extras. Survival appliances plus family room. 8 kW A mid-Sized system to help you weather powerless days and nights. Survival appliances plus family room and home office. 10 kW An emergency backup power system providing comfort and security. Survival appliances plus family room, home office and kitchen. 15 kW A powerful system with enough energy to run a small home. Survival appliances plus family room, home office kitchen and laundry room. 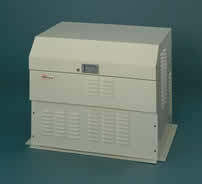 25 kW A mini-power plant that can run a small to mid-sized home or business. All of the above plus an air conditioning system. 30 kW and up A mini-power plant that can run a mid-sized to large home or business. All of the above and more. Live in total comfort. For a more detailed analysis, use our interactive Wattage Requirement Guide to determine how much power you'll need during a blackout. It's very important not to run too many appliances at once and overload your emergency power source. As a general rule, the total running (rated) and starting watts of all the appliances being used at one time should not exceed the power source's wattage. A growing number of Americans are converting their portable gasoline generators into emergency backup power systems. The minimum size recommended for home-emergency use is a 5,000-watt generator (starting around $600), which can power multiple appliances for 8 hours. Portable generators are available on our site and can be shipped anywhere around the country. Retail stores carry them also but they become scarce during a blackout and often it is difficult to find the cords, plugs, transfer switches and other parts needed. Most generators sold in hardware stores are low quality, price cutting types of units. We sell contractor quality, built to last. We carry several brands of portable generators including: VoltMaster Honda, Yamaha, Baldor, Winco, Onan, Robin and others. 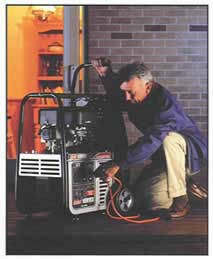 For more information on portable generators, Just Click > Portable Generators. The most common way to use a portable generator is to place it outdoors, then run an extension cord(s) through an open window or door to the chosen appliance. This approach works well for smaller generators because you can only plug in one or two items. You must connect the item directly unless you use a transfer switch. NOTE: You cannot run a generator indoors, not even in the garage, because a generator makes carbon-monoxide which is odorless an color-less and it can kill you and your family. Be sure to use appropriately sized power cords to carry the electric load. If you use an undersized cord, you can potentially damage the generator and appliances. Extension cords are rated by "gauges." For example, the most common size for generator use is 14, 12 and 10 gauge. The smaller the gauge number, the thicker the cord and the more electricity it can carry. Extension cords have several other drawbacks. First, most extension cords can't be plugged into a furnace, well pump, or ceiling-light fixture. And, if they are placed under rugs or carpets, heat can build up and spark a fire. To see a summary of issues involving portable generator see Portable vs Stationary generators. If you want the convenience, security, and comfort of a generator but don't want to venture out in inclement weather to get it started, you might want to consider getting an emergency standby generator. These personal power plants supply electricity to the majority of your house, not just to a few selected circuits. The all-weather generators are installed outside like a central air conditioner and are wired through an automatic transfer switch to the main electrical panel. The units run on natural gas, propane, or diesel fuel. Some systems can even be connected to a home's natural gas line, eliminating the need to fill fuel tanks. When the power goes out, there's a slight delay of 15 to 20 seconds, then the generator automatically kicks on - whether you're home or not - and continues running until power is restored, when it will automatically shut off. If you have critical applications such as life support equipment, computers or similar systems, you can install a UPS (uninterruptible power supply, a battery in a special box), and there will be no interruption of power to these devices while the generator starts up. 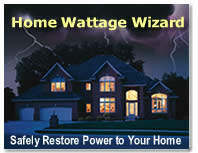 These systems are becoming increasingly popular in newer homes with sophisticated computers and electronics, and in rural areas where prolonged power outages are common. To see our extensive line of home standby generators, Just Click > Residential & Commercial Packaged Systems. For safety's sake, hire a licensed electrician to install a transfer switch that distributes power from the generator to the home's circuit box. This reduces the need for multiple extension cords running from the generator to specific appliances, and eliminates the risk of electrical "back feed" injuring utility workers working on downed power lines. The transfer switch (around $150 and up) is installed beside the main electrical panel, and then it's connected to circuits you'll need during a blackout. When the power goes out, you simply crank up the generator and run a single extension cord from it to the transfer switch. We sell transfer switches for small generators manufactured by Gen-Tran, to get more information, Just Click > Transfer Switches, Portable-Small Applications. For larger systems, Just Click > Transfer Switches, Large and Industrial. Once the generator is running, you can choose which circuits you want to use by flipping the switches on the transfer switch. It's important to keep track of what's being powered because the transfer switch is often wired into more circuits than the generator can handle all at once. A typical transfer-switch installation will take less than two hours and cost around $100-$200, but it's an investment that will be fully appreciated the next time the power goes out. 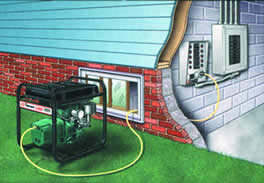 Make your installation simple so all family members can use the generator safely. Make an instruction sheet and put it with the generator so family members know what to do to restore power. NOW GET TO WORK AND FIGURE OUT WHAT YOU NEED FOR YOUR HOME OR BUSINESS STANDBY GENERATOR! Copyright © GeneratorJoe Inc. & GeneratorJoe®. All Rights Reserved.